Bake the cross cake in a cross pan. When it is cool, flip it onto a cake board. You will notice beveled sides of the cake. Ice the cake with white icing and a small icing spatula. With white icing and round tip #3 or #4, do the lace work on all sides except the flat top. Make sure you cover beveled sides also. To do the lacework, make squiggly lines over the surface to be covered. Refer to the below picture. With star tip, size #16 and white icing, make the shell border on all sides and the bottom edges of the cake. You should have three edges to do including the bottom. Make roses in white icing and place them all along the top of the cake. The leaves are made with green icing and leaf tip, size #352. Make the leaves around the roses. 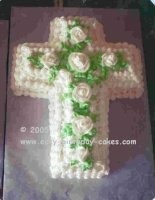 This cake works well for First Holy Communions and other religious events as well as for Baptisms. If you also need some favors for your baptism or christening, these Religious Girl or Religious Boy Candy Wrappers make great personalized favors for baptisms and christenings and they also serve as a special keepsake to remember this special occasion. Bake a sheet cake the size that you will need. Ice the cake with white buttercream icing. On the top of the cake mark 2 inches in from the edge all around the cake. Lightly connect the markings with a ruler or straight edge. You will have a rectangle on the top of the cake. With white icing and a round tip, size #5, do the lace work on the sides and top of the cake up to the rectangle. The lacework is done by making squiggly lines over the surface you are covering. With white icing and star tip, size #18, do a shell border on the bottom and top edge of the sides. Also do a shell border on the outline of the rectangle. Write your message in the rectangle using round tip, size #5. You can use pink icing for a girl and blue icing for a boy. Make the roses with white icing and place them around the message in the rectangle. 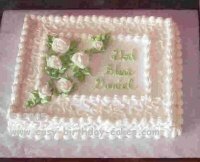 Put leaves around the roses using green icing and leaf tip, size #352.